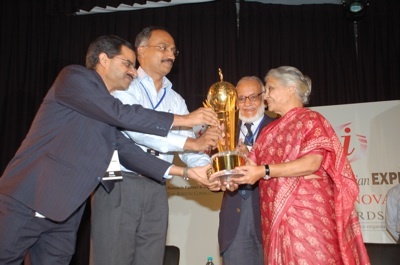 Dr. Nalin Singal, Director, Tourism Marketing, IRCTC receives the Gold Trophy from Smt. Shiela Dikshit, Chief Minister of NCT of Delhi. IRCTC has been innovatively adopting and managing e-ticketing technology creatively designed and developed by CMC to meet the diverse requirements of users of the Indian Railway system. This user friendly and transparent ticketing service operated by IRCTC is an outstanding example of constant innovations in technology adaptation, delivery and management to facilitate cross - country travel, an essential requirement of millions in India. 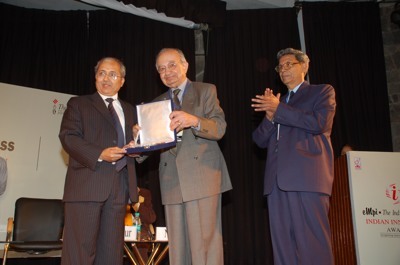 Dr. J K Gupta, Chief Financial Officer, CMC Limited receiving the Gold Trophy from Smt. Shiela Dikshit, Hon'ble Chief Minister of NCT of Delhi. IRCTC has been innovatively adopting and managing e-ticketing technology creatively designed and developed by CMC to meet the diverse requirements of users of the Indian Railway system. This user friendly and transparent ticketing service operated by IRCTC is an outstanding example of constant innovations in technology adaptation, delivery and management to facilitate cross country travel, an essential requirement of millions in India. Smt. 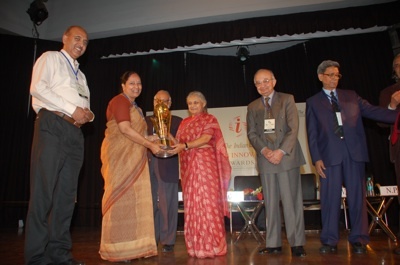 Sharada Muraleedharan, IAS, Executive Director, Kudumbashree, receiving the Award from Smt. Shiela Dikshit, Hon'ble Chief Minister of NCT of Delhi. For designing and implementing an innovative strategy enabling women to enter micro-finance and, through opportunities created by vibrant networking with local government institutions, to set up a variety of micro enterprises such as data entry units, providers of outsourced waste collection services in municipal areas and organizers of monthly markets. By making women effective contributors to development, the programme has empowered over 3.6 million women in small towns and villages. Shri. Umesh Magar, Technical Director, Magarpatta Township Development and Construction Company Limited, receiving the Gold Trophy from Smt. Shiela Dikshit, Hon'ble Chief Minister of NCT of Delhi. MTD & CC Ltd. has pioneered a new township development paradigm in India. The Magarpatta City Pattern stands apart in it's innovative approach of pooling small land holdings of farmers at a cost determined by them; and by making farmers the share holders in the company, each farmer gets the benefit of appreciation and share in profits from development. The innovative township of Magarpatta, which started with 120 farmers pooling their 300 years old land has now envisaged into a well-planned city, complete with elaborate neighbour- hoods. 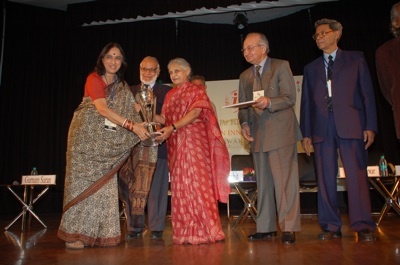 Dr. D K Pandey, National Co-ordinator & Dr. Neelam Gulati Sharma, General Secretary, Punjab State Council for Science & Technology receiving the Award from Smt. Shiela Dikshit, Hon'ble Chief Minister of NCT of Delhi. In recognition of it's campaign of Annual National Children's Science Congresses encouraging thousands of young minds to come forward and appreciate science in everyday life. 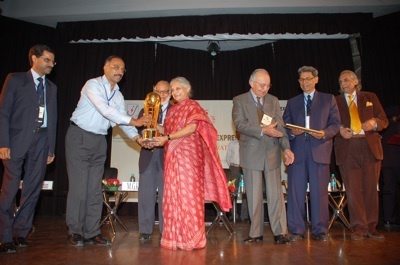 The campaign participated by leading scientists and science communicators and organised by a network of focal points in different states continues to make an outstanding contribution to science popularization movement across the country. 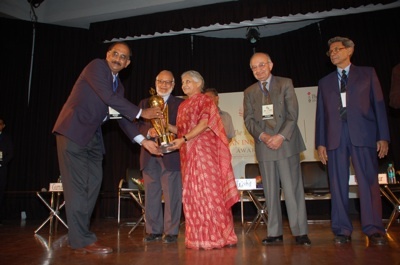 Dr. V. Kalyana Krishnan, Scientist & Head, Biomedical Wing, receiving the Silver Trophy from Smt. Shiela Dikshit, Hon'ble Chief Minister of NCT of Delhi. 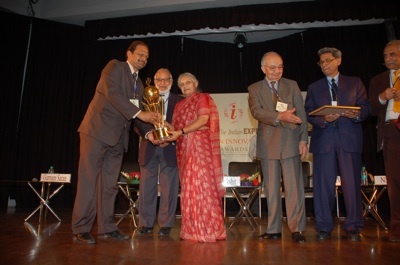 It's innovative approach of coalescing technology, engineering and medical sciences under a single organisational framework has enabled this premier medical teaching and research institution to indigenously develop bio-medical devices such as heart valves, blood bags and the like, and by joining hands with manufacturers to make these otherwise unaffordable critical health care items widely accessible. 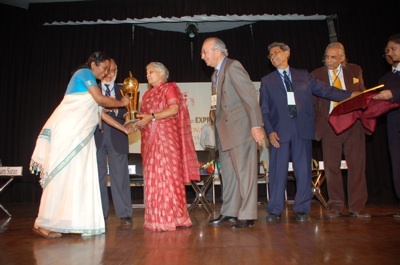 Dr. Mithu Alur, Founder Chairperson of Spastic Society of India (now called ADAPT) receiving the Silver Trophy from Smt. Shiela Dikshit, Hon'ble Chief Minister of NCT of Delhi. For it's outstanding innovation in the social services sector, by pioneering service delivery to marginalized children, youth and families with disability, through the famous ADAPT model: Able Disabled All People Together. This unique model of an NGO promotes inclusive education, thus leading to increased acceptance of inclusive practices in mainstream schools. The continuous research and developmental works in this field have shown results in many ways including a budgetary allocation by the Planning Commission for Inclusive Education in the country. 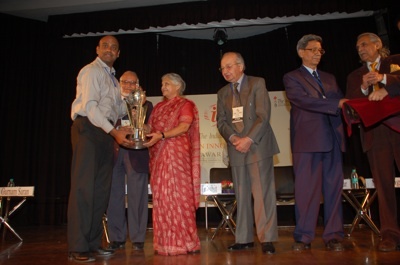 Shri M. G. Prakash, Regional Sales Manager (Rural) receiving the Silver Trophy from Smt. Shiela Dikshit, Hon'ble Chief Minister of NCT of Delhi. Awarded for it's 'Shakti' programme of innovatively blending business strategy with provision of sustainable livelihood to underprivileged rural women. Spread over 135,000 villages across 15 states it combines training of rural women in direct-to-home distribution with a branded social communication programme based on (or related to) personal and community health and hygiene, thereby redefining the concept of 'mass-marketing' of products to media-hidden regions. Shri. 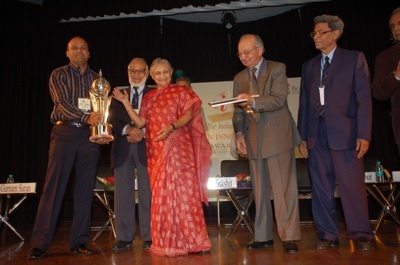 Amitabh Wardhan, CEO, receiving the Silver Trophy from Smt. Shiela Dikshit, Hon'ble Chief Minister of NCT of Delhi. By introducing multiplexes, PVR Limited has re-defined cinema viewing experience in India simultaneously providing a distribution channel to creative directors to show case their talent otherwise constrained by revenue requirements of large cinema halls. Combined with other firsts including computerized and online ticketing, mobile-based information & ticketing service, PVR Limited has brought cinema patrons back into the movie halls.